BLISS represents the leading edge in sailing yacht design and build, combining sailing performance with cruising luxury for the ultimate sailing holiday. BLISS' flexible accommodation configuration means that the yacht is equally suited to chartering with either three couples or two families with children in a very modern, stylish interior. Although perfectly suited for 6 guests in 3 staterooms, BLISS' guest area has the flexibility to sleep 10 guests using a combination of berth arrangements making her the ideal charter yacht for families or groups of friends. The full width master cabin can be portioned off to create a smaller master cabin plus twin bunk cabin arrangement. The “his and hers” ensuites in the master cabin in full cabin mode become an ensuite for the master and an ensuite for the bunk cabin when the partition is in place. 2 queen guest staterooms can be converted to 2 twin staterooms with pullmans. The yacht's large fuel capacity and generous amounts of space given to food storage and refrigeration allow the yacht to remain self sufficient in more remote locations for considerable amounts of time. 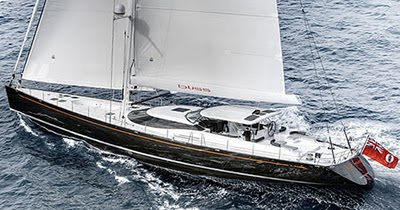 With a composite hull and performance rig, Bliss is able to sail efficiently in most wind conditions allowing comfortable, sedate cruising under sail or more exhilarating performance for the more adventurous. BLISS is available for charter in French Polynesia in 2010 where she has the capacity to take you to remote locations like the Tuamotu atolls for extended periods. Click here for charter specials and more information.